Les grandes vacances sont enfin là…. (summer vacation is finally here!). We can start to relax into it and breathe…it feels oh so good. Rémy is happy to have his sister home to play. And I am happy to have her home to start planning fun summer activities. Next week–I know already–we will go strawberry picking together. Today, for example, was a perfect start to our summer feel at home. Early after breakfast, Lulu, Rémy, and I decided to drive to our local Whole Foods Market to pick up butter and our favorite eggs to bake a loaf of hazelnut bread, madeleines, and a prepare savory crust for a vegetable tart. 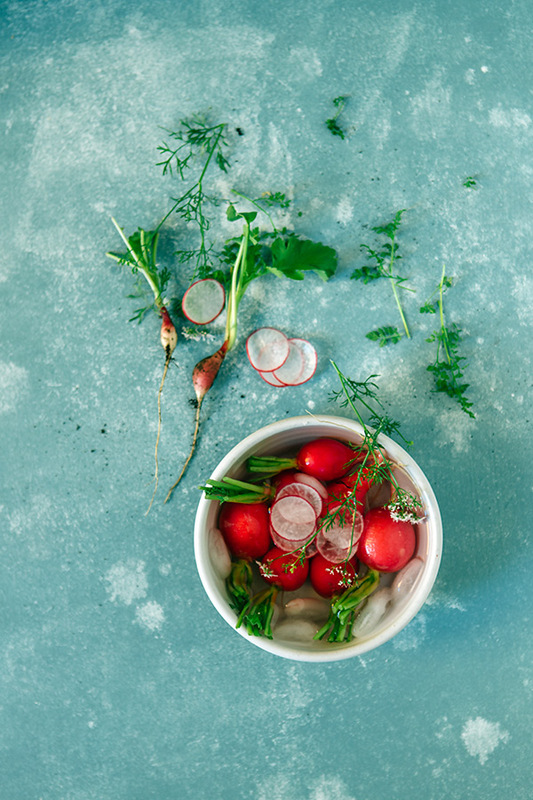 Upon entering the store, Lulu spotted gorgeous-looking bunches of pink radishes. “Tu en veux?” (do you want some?) I asked, happy to see how excited she was. Without listening, she grabbed two large bunches and looked at me smiling. Their leaves looked stunningly fresh and green. I had not planned to buy any but right away, I knew they were too pretty to pass. The roots and leaves would be perfect to make a finely shaved vegetable salad and a pot of soup which I’d turn into lunch. The radish leaf soup is extracted from my new cookbook. It’s one that makes me happy because nothing goes to waste, and it is also extremely fast and easy to put together. With slices of freshly baked hazelnut bread (it’s a new gluten free recipe I know you will love! ), it was a perfect kind of lunch, really…..
What a great way to use up a whole radish never tried radish leaves before. Also its so wonderful to hear children getting so excited about fresh produce. 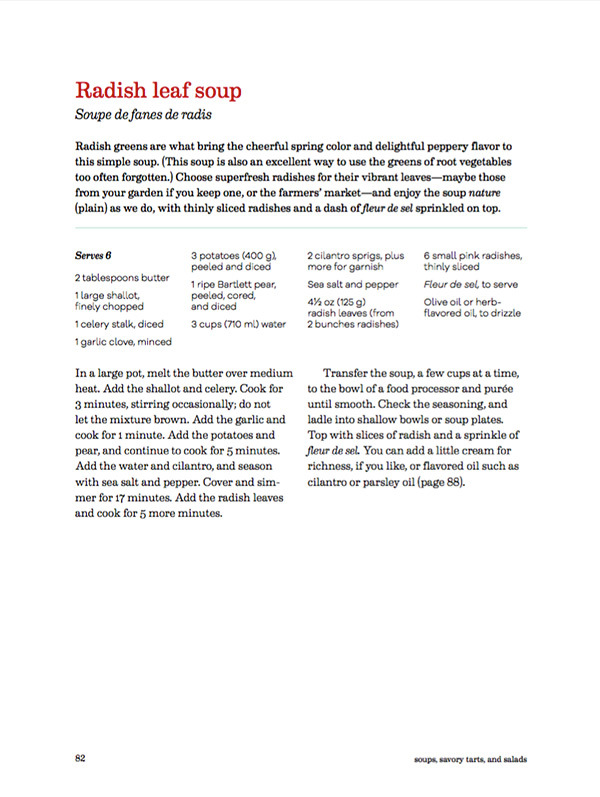 Seeing as I have lots of radish in my potager, I am definitely making this one tomorrow. Although seeing as I do not have pears on hand, I will simply leave that out. Nadia, I added an apple yesterday too! So interesting. I have never heard of this soup before today. However, in the morning, I find your recipe in my in-box. 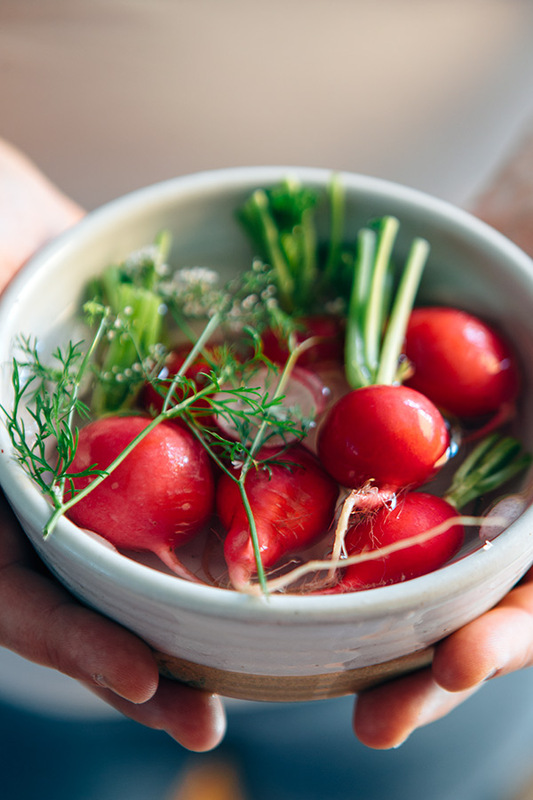 And this afternoon, when I go to make a garlic scape and walnut pesto recipe from Deborah Madison’s book, Kitchen Literacy, I open the book to a Radish Top Soup recipe. Two recipes in one day! It sounds like an excellent idea to use a green that is often thrown away. Thank you! Nothing to do with the wonderful recipe but could you tell me what is the ground cover (stones?) 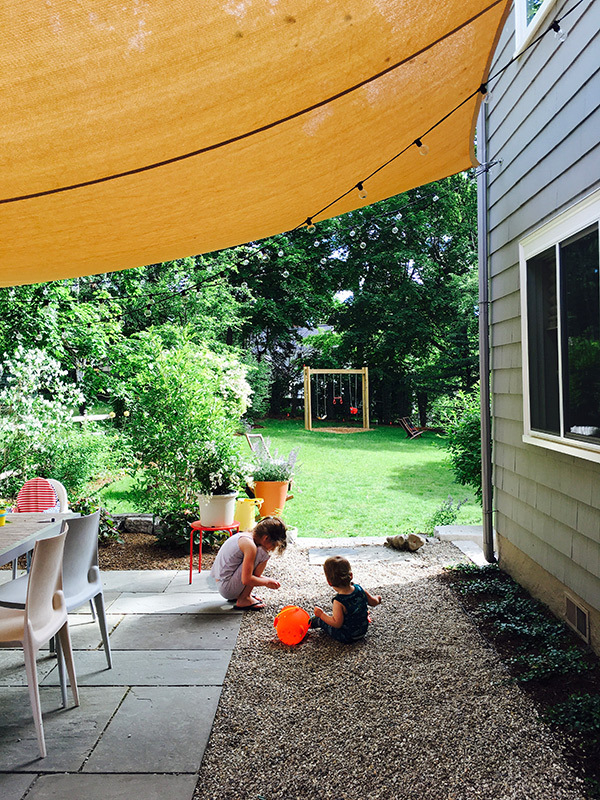 your son is sitting on (we are having a decision as to a backyard sandbox but this looks even better). Looks Great! So fresh and green! Very tasty recipe. I like it. Yours recipes are great, thanks for it! J’ai bien aimé cette recette, elle est bien unique! j’ai vraiment adoré cette recette ! Une manière très originale de consommer les radis. So interesting. I have never heard of this soup before today. However, in the morning, I find your recipe in my in-box. Quand j’étais fille au pair à Paris (il y a 50 ans! ), la dame pour qui je gardais les enfants m’a donné la recette de cette soupe en disant que c’était une recette très vieille qu’elle tenait de sa grand’mère et que c’etait une recette de l’ancienne cuisine française. Elle est vraiment très bonne! This is ingenious! Radishes are so overlooked in their own right, but I rarely think to make anything with their leafy tops. 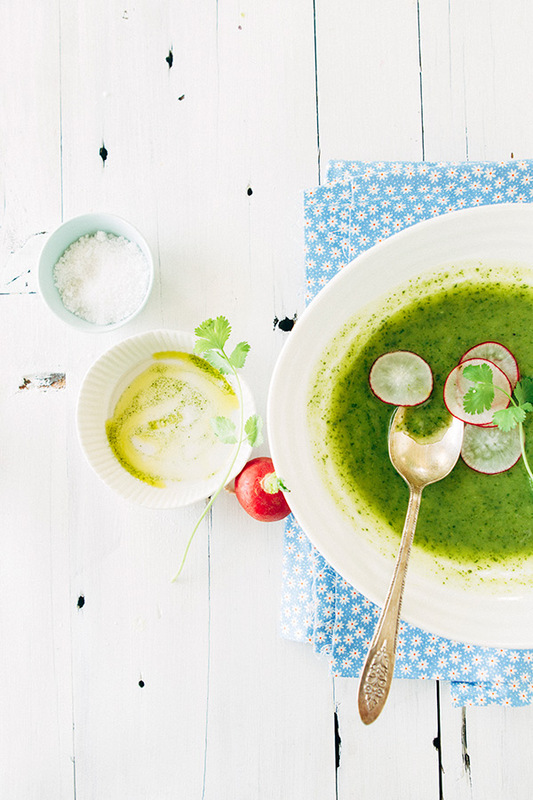 With warmer temps around the corner, this would be super refreshing for a lunch meal. Very tasty recipe. I like it. Thanks! This recipe looks amazing – will definitely add to my new vegan diet. Thanks so much for sharing! Can I use Chinese celery instead of celery? Can’t wait to try it out with my family!!! Have never had anything like this. Think it’s worth giving a shot. Thanks. Merci pour votre recette. Je l’ai essayé et c’est très bon. Puis cela me change de la soupe d’ortie, une bonne alternative !